Homophones are troublesome words for spellers because they sound identical, but are spelled differently. For some time now, we’ve been working our way alphabetically through the most common homophones in English. 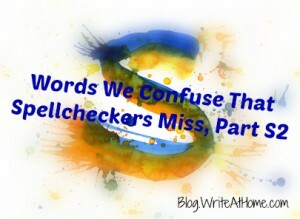 Recently, I posted the first set of homophones beginning with the letter S. This post addresses the rest of those. Sloe is the fruit of a blackthorn. It’s used to flavor a type of gin. Slow refers to speed. If you walk at a slow pace and observe, you may find some sloe among the bushes. When you are talking about flying high or rising quickly, you mean soar. Sore means hurt or aching. I enjoyed getting to soar with my new jetpack, but that rough landing has left me sore. The w in sword is silent. That means the preferred weapon of pirates, knights, and musketeers is spelled sword, while the past tense of soar is soared. When it was announced that it once belonged to King Arthur, the bid price of the sword soared. The bottom part of your shoe is its sole. Sole is also a kind of fish. And as an adjective, it means “only” or “single.” The invisible, eternal part of us is spelled soul. I am composed of a single body and a sole soul. Some can be used as an adjective (Give me some puppies) or a pronoun (Puppies? I want some!). If you mean “total,” particularly the total of an addition problem in math, you mean sum. After working on subtraction, the students did some sums. These words are both so common that they are rarely confused. A male offspring is a son. The enormous ball of burning gas that lights our days is the sun. Duh. My dog stopped digging up the garden after I had her spayed; then I got to work repairing the damage with a spade. A very small spot, stain, or amount is a speck. Specks is the plural. Specs, on the other hand, is a common contraction for either spectacles (glasses) or specifications. Specs, in the latter sense, is common in construction, engineering, and technology. Without my specs, I couldn’t see the specks on my tie. Staid is an adjective meaning “serious, sedate, and self-restrained.” Stayed is the past form of the verb stay. The staid old man stayed late. Staff is a versatile word. It can refer to the people who work together or “a rigid stick for walking or administering punishment.” Or it can mean “the horizontal lines and spaces use for written music.” When you are talking about a group of bacteria that causes a variety of illnesses, you mean staph — short of staphylococcus. We took hygienic precautions so the staff wouldn’t get a staph infection. A step that is part of a staircase or the group of steps altogether is called a stair. An intent, concentrated look is a stare. The groom’s stare was directed at his bride as she descended the stair. Stake has two primary meanings. It can be a concrete noun referring to a pointed stick driven into the ground or an abstract noun referring to something you could win or lose — something at risk. The delicious piece of meat — especially when aged, grilled, and served medium with mushrooms or maybe with some crab meat and asparagus and and a little Bearnaise….sorry. I got carried away. The meat is a steak. We made a bet and my stake was a steak dinner. It was a long time before I realized there was a difference between these two words. The adjective meaning “still and unmoving” is spelled stationary. Custom paper and envelopes used for letter writing is spelled stationery. Mother stood stationary, terrified and aghast as she beheld the misprinted stationery on her desk. Steal is a verb meaning “take without permission.” The hard metal is steel. The metal plant hired guards to make it difficult to steal the steel. Everyone knows that a step is a unit of stairs. Or moving one foot forward. Some, however, are unaware that a flat area of land with grass and few trees usually found in southeastern Europe and Asia is known as a steppe. While visiting my cousin’s farm in Indonesia, I took my first step on a steppe. Style is the more common word these days. It has multiple meanings, including, “manner of performance or expression” or “distinctive quality.” A stile is likely only familiar to people who have lived in the country. 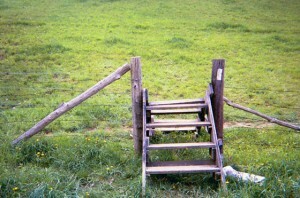 It’s a step or steps that allow for passage over a fence. Stoop can be a verb meaning “to bend down.” It can also be a noun referring to a porch or entryway to a house. A stoup is a container for holy water at the entrance to a church. And a stupe is either a hot, wet, often medicated cloth or a stupid person. The stupe tripped over the stoop at the church entrance and tumbled awkwardly into the stoup, splashing congregants with holy water. A sty is a pigpen. A stye is an inflamed swelling of the eyelid, although you can also spell it sty. His vision hampered by styes, Vernon tumbled accidentally into the muddy sty. Sometimes the best succor you can offer a sick child is a cherry-flavored sucker. Suede is a kind of soft leather. Swayed is the past form or past participle of the verb sway. I ordered a glass of sweet tea brought up to my hotel suite. On Sunday I ate a sundae. How do you even think of all these? That’s pretty amazing. I particularly enjoy reading your word and homophone lists; they are very thorough and informative. I often refer students to your blog. Familiarity with these common homophones will benefit all. I am shocked how often I see these misused.